Our excellent technical foundations and knowledge can ensure superior quality garage door repair services. We are masters in major problems, installations and repairs of all brands and types of doors with the assistance of the greatest equipment in California. Professional repair and replacement services for all types of residential doors. Having garage problems can be an exhausting ordeal. Our team at Garage Door Repair El Sobrante is dedicated to keeping your experience with your garage a positive one. With skilled technicians always on call, we’re able to provide you with the garage door services you need when you need them most. Get springs, cables, and other parts replaced, or have new units installed at a rate that our customers say is just right. If you’re in need of a garage door company, look no further. Each of our team members are local making us a part of a community that we’re proud to serve. Our technicians are happy to provide their expertise, which is so critical to the daily lives of many people in California. We provide safety inspections and testing on all the major brands as well as emergency repair services to keep the world spinning when your garage door opener stops. Feel good knowing that when you choose us, you’re supporting the community. When it comes to garage door openers, our team has you covered. We provide installation and performance testing on top brands in the market. Whether you decide to go with Craftsman, Genie, or any other major brand, each of our technicians is able to professionally install your new machine with no trouble. Our technicians also perform safety inspections as well as operational testing to ensure that your garage is functioning properly within consumer safety guidelines. In addition to openers, we’re also equipped to install almost every type of drive system available on the residential market. It doesn’t matter if you have a chain-driven, screw-driven, or a belt-driven opener because our technicians can do it all. We also do door installation for sectional doors as well as one-piece doors, and our knowledgeable technicians know exactly how to handle wood, metal, vinyl doors and more. Your garage is in safe hands when you install with us! Preventative maintenance and repairs are what our customers love most about us. You can get the most out of your garage by extending its life with consistent scheduled preventative maintenance. We’ll inspect your garage door springs and cables for warning signs, and perform preventative maintenance so you can avoid dealing with broken parts. We provide servicing for both extension springs and torsion Springs, so you're covered when it comes to spring maintenance and replacements. We also provide emergency repairs for broken springs when you need it most. In addition to spring repair and replacement, we do broken garage door cable replacement as well as cable adjustment should it slip off its drum. When it comes to maintenance and repairs, we even do professional damage repairs for your door such as dints, dings, and even weight balancing. You get the most technical coverage when you choose us. 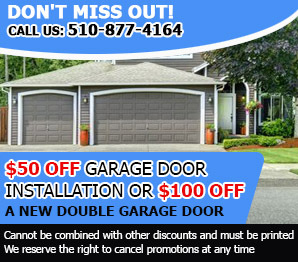 Our customers prefer to use “Garage Door Repair El Sobrante” because we offer everything they need at an affordable rate. Our technicians are ready to provide you with the same quality that many people have come to expect from us. Get emergency service when you need it and maintenance service on all the top brands. Be sure to check our services page for more information, and contact us to have a technician work on your garage. Our experience is long and our capacity to provide efficient garage door repair services is guaranteed. We maintain all automatic garage door openers properly, are the best specialists in zip code 94803 for repairs and the most efficient team in California.